1. Check for visa requirements prior to departure. Bali’s visa regulations seem to be constantly changing. All of it can be a total headache, so it’s best to check current rules and regulations with the Indonesian embassy in your country before traveling. Bali now offers free 30-day, on-arrival visas to citizens of many countries around the world. If you wish to stay longer then you will need to do so by an agent in Bali (ask around for the best agent in the area you are staying), or send your passport to your nearest embassy with some cash for a 60-day tourist visa. 2. Take advantage of layovers. Bali is a major tourist destination, and flights into the capital city of Denpasar are easy to come by. Surprisingly, they’re affordable, as airlines continue to offer unbeatable deals and incentives. Also, flying to Bali from most places in the world require a stopover in another international airport hub, such as Dubai, Kuala Lumpur, Singapore, Jakarta, and more. Take advantage of those stopovers and spend a few days in a new scenery, either before or after your stay in Bali. 3. Board fees and transportation tips. Getting from point A to point B can be a bit overwhelming at times. Not to mention some airlines charge you an arm and a leg to check surfboards. Be sure to use Skyscanner to check routes and use LUEX’s list of airline surf baggage fees to check how much it will cost to bring boards. When you finally exit customs in the airport, expect to be approached by a swarm of touts trying to help you with anything from carrying your luggage to organizing a taxi ride. Payment will be expected even if you didn’t ask for help, so a firm “no thanks” is the best way to avoid being fleeced. Most taxi drivers at the airport seem to wait in hope of ripping off ignorant and travel-frazzled tourists. So unless your hustle is strong and you think you can negotiate a fair rate, it’s best to organize the transfer to your accommodation in advance. Most hotels and surf camps will be happy to arrange this for you. If you’re staying in a private villa, you can use Facebook groups like Canggu Community to find a local driver who will charge a more reasonable fee. Uber is cheap and works very well in much of Bali (Canggu less so), and you can use the free wifi in the airport to organize a ride if you haven’t made prior arrangements. Alternatively, just call for a Bluebird Taxi to come and pick you up. Bluebird is by far the most reliable taxi service in Bali, as all their cars are equipped with meter readers, which your fare is based upon (just make sure to check the driver turns it on). Bali isn’t all that big, so it’s easy enough to get around to many different areas and spots in just one day. That said, pretty much all the surf action is concentrated on the southern edge of the island, from Keramas to the east down to the fabled Bukit Peninsula, then westward past Kuta and Canggu up to Balian and Medewi. That said, most surfers visiting Bali will stay in one of four places: Kuta, the Bukit Peninsula, Seminyak, or Canggu. Kuta is the closest to the airport and perhaps the primary hub of tourism in Bali. Of course, there are some beautiful parts of Kuta, but a lot of the area is a full of drunk tourists, drug-pushing pimps, and brash, sweaty nightclubs populated with Aussie bogans and Brit lager louts. But if you’re after a raucous party, it may be worth a look for a night out. Otherwise, it’s best avoided. Heading further northwest from Kuta you first run into Seminyak, then Canggu. Seminyak could perhaps best be described as a more upmarket version of Kuta—it’s very nice and fairly ritzy, but ultimately still very touristy. Canggu is still relatively undeveloped with plenty of rice field views to enjoy. While tourism is growing in the region, most foreigners tend to be expats or on longer stays, and more culturally sensitive. Canggu hosts a treasure trove of small, cheap restaurants and cafes serving delicious meals of all origins and flavors. Despite the hipster vibes, the legendary Deus ex Machina parties are great fun too. There are a variety of waves for all levels. From perfect beginner and longboard setups at Berawa and Batu Bolong to more high performance waves at Echo Beach, the region has something for everyone. You’re not going to have the lineup to yourself, but crowds tend to be mellow and friendly. The general standard of surfer isn’t super high, so you can be sure to catch a fair amount of waves. Kedungu up the coast near Tanah Lot Temple can be a bit quieter if you want some solitude. Without question the Bukit Peninsula plays host to the best waves in Bali, including legendary names like Uluwatu, Padang Padang, Impossibles, Bingin, and Dreamland. It’s also one of the most beautiful parts of Bali—drier and more arid than the rest of the island with dramatic cliffs plunging down to incredible white sandy beaches and sapphire-like water. However, many of the waves break heavily over shallow and sharp reef, and crowds can be fairly cut-throat on a good swell. You definitely need to bring your A game if you want a good share of waves without paying skin tax to the reef. While there’s no shortage of restaurants, the dining and drinking options aren’t as extensive as Canggu. There’s an incredible range of accommodation in Bali, from 5-star luxury hotels and resorts to cheap surf camps. Your best option will depend on your group, budget, surf and nightlife tastes, social preferences, etc. Be sure to check out an overview of accommodation in Bali. 5. Scooters are your friends. For long journeys, it may be worthwhile arranging a local driver or Bluebird taxi for comfort’s sake, but the real vehicle of choice in Bali is the scooter. The ability to weave in and around other vehicles and obstacles on the road means you’ll get to your destination faster than any other method. There are many places to rent scooters all around the island, so just ask around. Prices are negotiable, especially if you’re staying for a longer period or a renting as a group. Most scooters are automatic so you don’t have to worry about changing gear if you’re not used to such bikes. Make sure to check the tires and brakes. Most importantly, get yourself a helmet! Traffic is certainly hectic and it can be intimidating at first. But once you get the hang of it, the system works very well for scooters. The Balinese tend to be quite horn happy, which is confusing until you get used to it. A quick beep doesn’t mean you’ve done anything wrong. They’re just letting you know where they are or that they’re about to overtake you. Watch out for potholes, wear a helmet and shoes, listen out for faster bikes approaching from behind, and you’ll be grand. Gasoline can be bought cheaply at the many roadside shacks, and for some reason it always seems to come in Absolut Vodka bottles. The myriad of winding roads can be tough to navigate, but Google Maps works surprisingly well (even with no internet, as long as gps is enabled). Most cafes and warungs have free wifi, so if you get lost just pull in, grab a drink, and load up the map. Technically you should have either a local or international driving license to legally ride a scooter in Bali. In short, you wouldn’t be the first to operate a scooter without either of these. Riding without a valid license may result in a fine if pulled over by the police. The size of the fine may vary depending on the officer and your negotiation skills, but it can be a good idea to keep a 50,000 Rupiah note somewhere where you can reach for it without flashing any other cash. More seriously, your travel insurance is unlikely to pay out in the event of an accident if you ride without a license. Balinese waves come in pretty much every variety and performance level you can imagine. 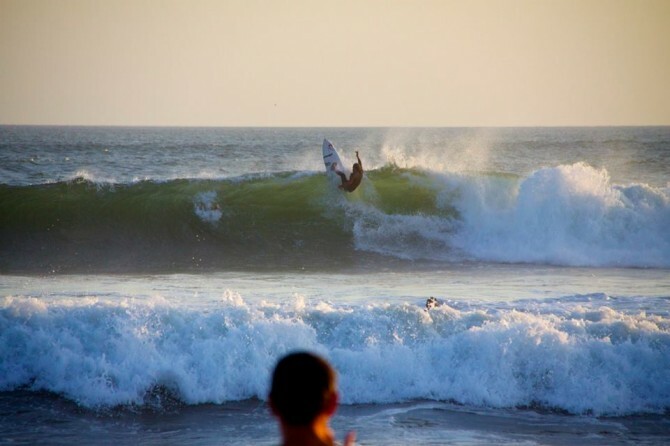 Generally, the main season is over the dry season (June to September), which sees the biggest swells and (generally) favorable winds on the West Coast. However, the rainy season is much quieter. And due to the might of the Indian Ocean, solid swells are not uncommon. Winds tend to be offshore on the east coast during this period. There’s a lot of energy in the Indian Ocean, and if this is your first trip it might be a good idea to bring a slightly bigger or thicker board than you normally use to help get into the waves. Rips can be surprisingly strong, and swimming isn’t advisable at many beaches. There are many surf schools and guides on Bali, catering to all skill levels. Some are better than others, so it’s always worth speaking to your travel agent to avoid disappointment. One thing to bear in mind during the wet season is that the water isn’t always as warm as you might imagine. Particularly during early morning and sunset sessions, a rash vest or even neoprene top can be a good idea, especially if the wind is up. Balinese food is delicious! Staple meals include the quintessential Nasi Goreng (fried rice) and Mie Goreng (fried noodle)—both great options on a budget. Nasi Campur is also popular and it’s essentially a lot like a buffet of various types of meat, vegetables, egg, tofu and rice or noodles. Seafood is widely available and delicious, particularly grilled snapper. Babi Guling (roasted pig) is a delicious delicacy. You can find restaurants serving any kind of food. In addition to the delicious local foodstuffs, pizzas, burgers, curries, Thai food, pies, and sushi are there if you look. Vegetarians and vegans are well catered for, particular in Canggu (raw double organic wild lettuce-fed free range beetroot smoothie, anyone? ), but there’s plenty to keep dedicated carnivores happy, too. Breakfast is equally varied, and you will have no problem finding anything from a Full English to healthy smoothie bowls, fresh fruit, and incredible egg-toast-and-smashed-avocado concoctions. 8. Surfing isn’t the only extracurricular activity offered in Bali. If you need a break from surfing, relaxing on the beach, drinking coconut water, partying, and eating, there are plenty of other things to keep you entertained. 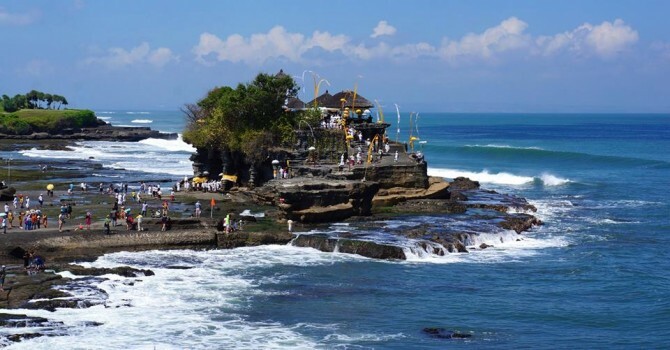 Be sure to check out at least one of the many temples (Tanah Lot being the most famous). Other activities are on offer, including yoga courses, volcano hiking, dirt biking, white water rafting, elephant rides, cooking and jewelry-making classes , and diving. Take a trip inland to Ubud for yoga retreats and to check out the monkey forest. Or head to Nusa Dua where the long reef provides perfect sheltered water for snorkeling. Nusa Lembongan is an island off the East Coast of Bali. It’s only an hour or so from Sanur by speed boat, but it’s vey different from Bali. The Mangrove Point at the north of the island features an offshore reef with incredible snorkeling, while breaks like Shipwrecks and Lacerations offer great waves with rather quiet lineups. Lembongan is much less developed than Bali, and despite a couple of high-end resorts and dive operations, the infrastructure is charmingly terrible. Many roads are in awful condition, and the rickety single lane wooden bridge to neighboring Nusa Ceningan can be quite exciting on a scooter. The island tends to be much quieter than Bali with fewer tourists, so it’s excellent for a relaxing or romantic getaway without the hustle and bustle of the mainland. The landscape is beautiful, with stunning lagoons, coves, and blowholes, while much of the coast is dominated by intriguing seaweed farms. For more Bali tips and advice check out LUEX Magazine.